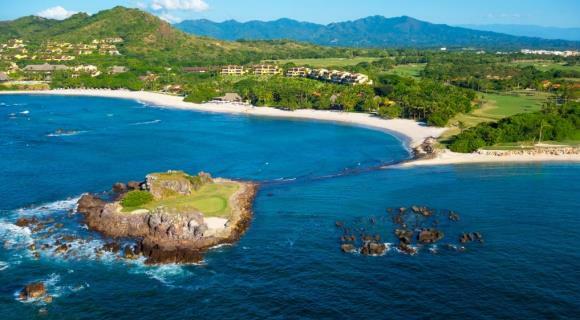 The hole, part of the Pacífico Golf Course in the Punta Mita development of the Riviera Nayarit, places 7th in the world for being the only natural island green. The UK edition of GQ Magazine published an article sponsored by Hugo Boss watches where they picked the top ten Par 3 holes in the world, among them, Hole 3B at the Pacífico Golf Course in Punta Mita in the Riviera Nayarit. Better known as the “Tail of the Whale,” Hole 3B was positioned in 7th place on this prestigious list of impressive holes. The Riviera Nayarit’s Glamour Peninsula shines once again for its excellence, and this time it’s the only destination in Mexico on this list. “This is a magazine whose readers have a very high purchasing power, meaning they’re potential clients for the Riviera Nayarit, especially in reference to the United Kingdom, which has been the top Emerging Market from among those where we’re promoting the Destination,” said Marc Murphy, Managing Director of the Riviera Nayarit Conventions and Visitors Bureau.